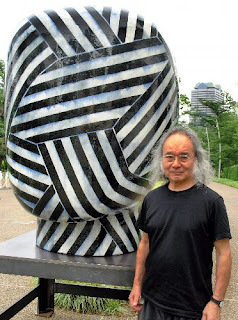 So, I'm in Tokyo yesterday wondering how in the world could anyone survive a summer in such a concrete jungle; finished my meeting early--stay tuned for a new ceramic focused travel company, mostly for potters--and wondered should I hang around the jungle or head home to the bay. No brainer, chose the later and made a beeline for the subway station. As I'm waiting for the train to arrive who should I spy out the corner of my eye but Seto veteran ceramic artist Kato Kiyoyuki! "Kato-sensei," I call out and he is just as surprised as I was; "Oh yeah, you're the fellow I met at the Japan Ceramic Society exhibition who has a gallery in Mishima, right?" Right, and so we take the same train and then board the same bullet train, me for Mishima(45 minutes) and he to Nagoya(a few hours). I ask him what he was in Tokyo for and he replied it was an event at the Sogetsu (http://www.sogetsu.or.jp/english/index.html) and now he too couldn't wait to head on home. Time was short so I asked him what he's making these days---large pieces in Echizen--his background--family made Oribe roof tiles---and what his plans were for coming exhibitions--nothing this year, next year Tokyo----and I said he might think about taking his family history and make it the theme for his next exhibition, mainly Oribe jars as he hasn't done that for a long time. 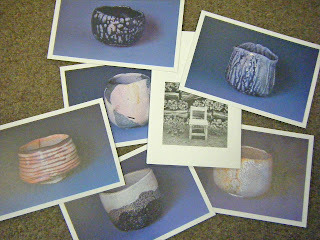 He liked that idea and even said he has some glaze vats that his pop and grandfather mixed; perfect! Perfect was not how he was feeling though that the long-running Asahi Ceramic Art Exhibition had been shut down for good, he was darn right pissed off. 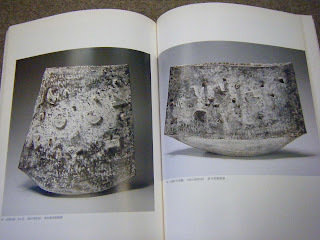 I then asked about growing up after WWII and if he was influenced by Sodeisha---not one iota---and that he was never impressed with Yagi Kazuo---Mr.Samza's walk was boring compared to Noguchi--and that his main influence back then was the ceramic artist Yasuhara Kimei! Now I told him how I also liked Yasuhara and that I've offered some of his works at our gallery, he liked that a lot. 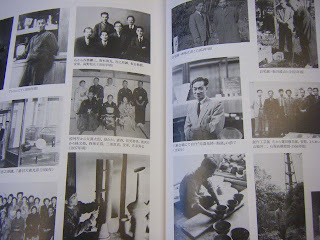 A few photos are seen here from a Yasuhara retrospective catalog in my library, dating from 1933-1964. I hope to have more Yasuhara one day. 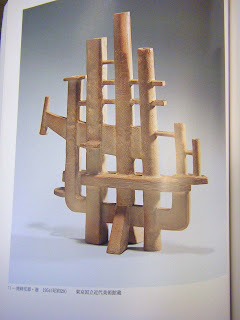 Well, Mishima was on the horizon and I bid sayonara, he was very pleased of our happy coincidence to meet as was I. I also hope to visit him in Seto soon, a major ceramic artist and a very nice gentleman too. 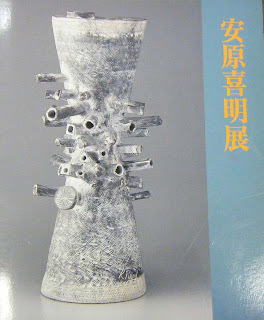 Two debut exhibitions happening and one is Ajiki Jun at Ichihata,Matsue from July 23-29, whose chawan we were the first to show in the world and we have a few gems at www.japanesepottery now, and the Okayama debut at Tenmaya of Miyao Masayuki on now until July 21st; best to both of these emerging talents!